Flash cartridges for retro consoles have proven to be extremely popular with gamers. That’s hardly surprising, who wouldn’t want access to hundreds, even thousands of games on one cartridge? Well, Nintendo’s lawyers say you don’t, but possible legalities aside there’s something just unbelievably awesome about having a consoles entire back catalogue at your disposal on one all conquering cartridge. In the case of the Super Nintendo, that goal has proven to be somewhat difficult since an unusually large number of SNES cartridges included enhancement chips. These enhancement chips added extra functionality to the stock SNES hardware. As we saw in our SuperUFO review, games which use these enhancement chips simply won’t work when they are not present, meaning a basic flash cartridge cannot run them. Short of making a flash cartridge that actually contains all the available enhancement chips, you might imagine this problem was insurmountable. However, thanks to the cleverly designed SD2SNES, that might not be the case. The SD2SNES is the most advanced flash cartridge available for the Super Nintendo. What sets it apart from other models is the inclusion of a powerful “field-programmable gate array” chip. These amazing little chips can mimic all kinds of hardware and can be reprogrammed out in the “field” with various different configurations. Using the FPGA, hardware hacking genius Ikari has actually implemented many of the Super Nintendo enhancement chips. That means that games that would simply fail to run on other cartridges are now completely playable on the SD2SNES, a really fantastic achievement. Of course, the FPGA isn’t limited to simulating existing enhancement chips. Emulator author Byuu has actually implemented a whole new enhancement chip called “MSU1” (Media Streaming Unit revision 1). This enhancement chip may have never existed in real silicon form, but the SD2SNES can simulate it using its FPGA. MSU1 is designed to give the SNES access to mass storage, typically for video or audio. A number of ROM hacks and homebrew projects support the chip, including a port of the FMV game Road Avenger and a spectacular enhanced version of The Legend of Zelda – Link to the Past, which now features a full CD quality soundtrack. Imagine if Nintendo had actually released a CD add-on for the console, these are games that we could have seen actually appear on the hardware. Note that to play MSU1 games you will need a suitably fast SD card, there’s a list of compatible cards available here. Update July 2017 – Before we go further into this review, you may have heard that certain flash cartridges can cause excessive wear and tear on your retro consoles. If you’re considering a SD2SNES cartridge you will be pleased to know that DBElectronics gives this particular device a clean bill of health. Our SD2SNES arrived with our Everdrive 64 from those wonderful folks at RetroTowers.co.uk. As with the ED64, the cartridge ships with no packaging, no outer box and no instructions. The SD2SNES isn’t quite plug and play and there are a few files you will need to copy to your SD card before you start. First of all, you need to grab the latest firmware from this page. Unzip and copy the SD2SNES folder from the zip file to your SD card. For full enhancement chip support, you should also download the various DSP bin files available on this page and copy them to your SD2SNES folder too. After that, all you need are some SNES ROMS to play (you can put them anywhere BUT the SD2SNES folder) and you’re ready to rock and roll. 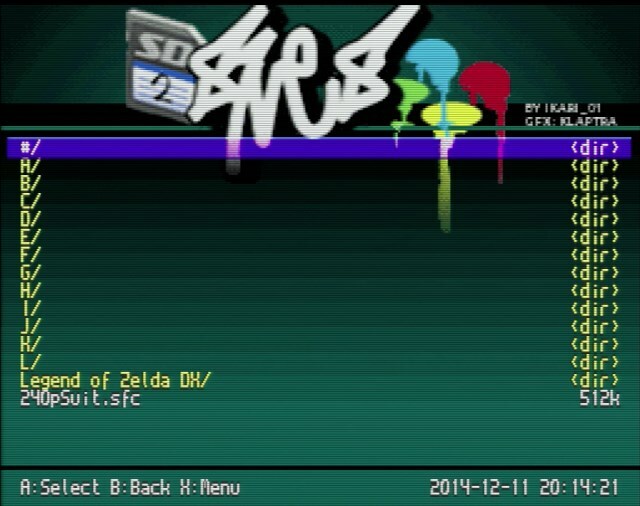 SD2SNES Main menu. Custom wallpaper is currently not supported, but planned for a future upgrade. Once you pop your SD equipped SD2SNES cartridge into your Super Nintendo (or Super Famicom, of course) and power on, the cartridges main menu will appear. Navigating the menu is as straightforward as you would expect. Long filenames are fully supported (unlike the SuperUFO) and all you need to do is simply select a ROM with the d-pad and press A. The game will then load and start instantly. Save games are fully supported too, and the SD2SNES will automatically back up your save games every few seconds. When you’re done playing, it’s possible to get back to the SD2SNES main menu by holding down the reset button. Unfortunately, our test console had an older SuperCIC modification in it that wouldn’t allow us to reset back to the SD2SNES menu, leaving us with no choice but to power cycle the console. In practise this shouldn’t matter too much, the SNES was designed to be power cycled once you had finished playing a game, of course, but it’s something to keep in mind. Newer SuperCIC chips allow you to reset back to the main menu by double-tapping the reset button and the newest SuperCIC chips (that we now fit) support an in-game reset by holding down a button combination on the joypad. The SD2SNES is the most compatible SNES flash cartridge on the market, but there are still some games that do not work. Most notably any game using the SuperFX chip (e.g Starfox or Yoshi’s Island) or any game using the SA-1 enhancement chip (e.g Kirby Superstar, Super Mario RPG: Legend of the Seven Stars). It’s possible that these games will be supported in future firmware updates. There are some obscure Japanese titles (e.g Hayazashi Nidan: Morita Shougi 1 and 2) that actually contain enhancement chips too advanced for the SD2SNES to ever possibly simulate. If you’re curious as to what these amazing games might be, they’re Shogi games. Shogi is a board game that is often referred to as the Japanese chess. The enhancement chips on these cartridges are entirely dedicated to advanced AI for these games. That’s right, the most advanced enhancement chip ever seen on a SNES game was for a board game simulator. The SD2SNES is an amazing product and we don’t say that lightly. What Ikari has managed to achieve here is something that many people originally thought impossible. While there are still a tantalising number of quality titles that the cartridge cannot play, you’re still getting easily the best and most widely compatible SNES flash cartridge. Little extras like the fan created MSU1 are just the icing on the cake. At £149.99 the cartridge isn’t an impulse purchase, but it’s obviously in a different league to the SuperUFO and even the Super Everdrive. This really is the ultimate upgrade for your Super Nintendo. The SD2SNES is available NOW from RetroTowers.co.uk. Pricey, but nothing comes close in terms of features, this really is Super Nintendo nirvana. Great review! I wasn’t aware of the enhanced Zelda. Just downloaded and tested it. Awesome! Can I get a no-run-around answer to this question? where can I download the full set of bin files for the SD2SNES? including the S-RTC, MSU1, OBC1 (if that’s even a valid question). There’s no one out there with the balls to post a download link to all bin files in one download location. Can you send me yours, please? whatever is in your SD2SNES sd card. ^ That’s not all of them. It’s all that are compatible. Can someone please clarify something for me: does the sd2snes allow me to play NTSC roms at their native speed at 60Hz on my PAL Snes, or does it downclock them to 50Hz? Or do i need a seperate CIC mod in the console for this to function? You would need a SuperCIC for that. some of my smw rom hacks have a sound glitch on my sd2snes how can i fix that ?? Probably the authors never tested them on real hardware.